Instagram Followers Game - Are you playing the Insta Followers Game? Tweet This So how do you win the Instagram followers game? The Instagram Followers Game. So you had a good day, you picked up 10 new followers on Instagram. The very next day you get another 10 followers but lose the 12 from yesterday. Does this sound familiar? Well, welcome to the Instagram Followers Game. You’re getting Instagram followers but then you are losing just as many. Why do we lose as many Instagram followers as we gain? Well, it is because there are just so many game players on Instagram. You are playing the Instagram followers game and don’t even know it. Everyone is out to get followers because it is your followers who give you engagement and who get you seen. Very few Instagram members manage to grow their follower count without working incredibly hard because everyone on Instagram is following and unfollowing in the hope that you follow back. It has become a big game now. The only ones who really manage to get a big following and keep that following and actually have it grow are the ones who manage to get over that invisible line where you are followed by so many people that you get more follows just because you are seen and seen as someone to follow. The momentum of follows/unfollows works for you. If you can’t get to that invisible line where momentum is in your favour you will always seem to grow so slowly that it is not worth the effort or worse still just bounce around in the same spot. So why can’t you keep your Instagram followers? Well, a lot of it comes down to when you joined. If you join a site in an accelerated growth period then as long as you are making a few posts your gonna grow with the site. Getting big followers is a done deal. If however, you join Instagram now then you will really struggle unless you put a ton of work into it or you’re a celeb or an influencer. There are tons of apps that let you see who follows you and who follows back and allow bulk unfollowing etc. We live in an Instagram era where it is “oh I followed them they haven’t followed back” and they unfollow. Which begs the question why did they follow you in the first place? Well, it is not because of your content or they would have stuck around. It is purely because they are hoping you help tick their stats up. But don’t let that worry you because these are not the guys who are ultimately gonna help push your social engagement forward. The thing is if you are using any social media correctly then you want to keep who you follow down to a minimum so that your feed does have the content that you want to see. If you are just following anyone to grow your Instagram followers up then your Insta feed is going to be flooded with content that you are just not interested in. The only social that is an exception to this rule is Twitter because they have a very cool feature called Twitter Lists where you can group followers into different lists and then view individual lists so you can set it and only ever see what you are really interested in despite following everyone under the sun. Tweet This This is how you win the Instagram Followers Game? 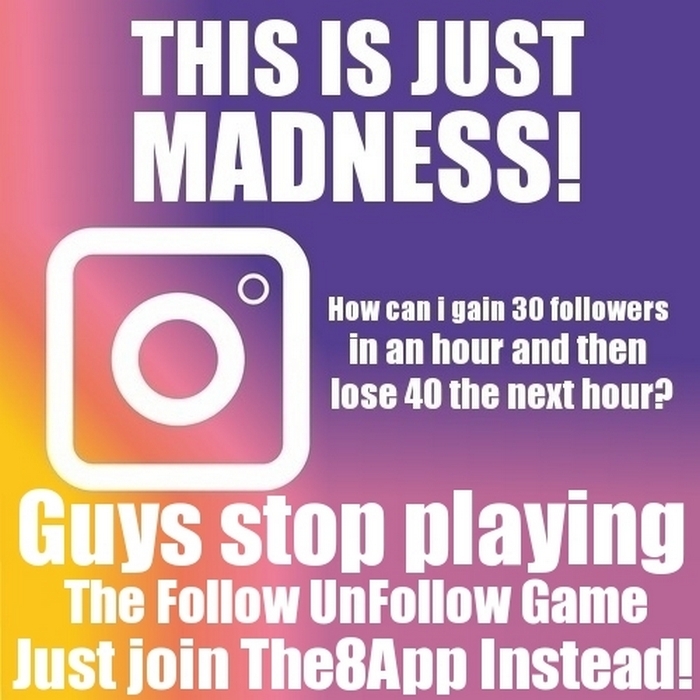 Well if you are looking for big numbers of followers on Instagram and you are just bouncing around on the spot then I’m sorry to say you are probably going to struggle/ If you are just starting on Insta and missed the growth period then you have missed the boat and again your probably never gonna get to where you want to be without extreme work. If your not prepared to put the daily work required then STOP reading now! Instagram is a social channel that lets it’s members expand their brand through their images. For businesses especially, it’s a way to humanise the brand and bring it to followers. New products can be showcased, sales can be increased, just by sharing images. But the problem with Instagram is that it is incredibly hard to build a big following. Unless you are a known brand or a celebrity or sportsman or woman. Now you can just go buy yourself a stack of Instagram followers, but these guys are more than likely fake accounts or just low-quality members that really won’t help you achieve your goals on Instagram. THIS IS GOING TO TAKE TIME AND EFFORT ON YOUR PART … It is going to take daily, consistent activity around your page and other members. These are the guys who have sponsorship deals with brands, who are paid to share content. It is virtually impossible for you to get where they are. But here is the solution you just work Instagram correctly, a few posts a day. You only follow people you are interested in and you don’t play the Instagram Followers Game. You then Get yourself over to The8App and you join there instantly. Why? because The8App is a lot like Instagram and it is about to go through that explosive period that Instagram did. Plus with The8App you are rewarded for the views that the ads on your pages receive. We just spoke above about sponsorship deals and getting paid by brands on Instagram. Well on The8App a feature called the Sponsor Hub is about to launch where the big brands can pay you to advertise their message. The Sponsor Hub will be open to all members not just those with a big following. If you have 10, 50, 10000, 100000 followers it doesn’t matter. With the Sponsor Hub, it doesn’t matter, you can still be offered deals. You see with The8App it all comes down to quality and not quantity. Your welcome i hope you found it useful. Like always you did a great lob and introduce us very in depth to Instagram. I had a long time no account there because I do not use a mobile phone. follow your suggestions and tips. I have found that posting from desktop rather than mobile puts some kind of security filter on posts making the hashtags you use no longer work.. I tested this i made a post via desktop with 5 tags no engagement, duplicated the post on mobile with same tags and had 30 likes… i tested again and very similar results… instagram doesn’t want members posting from desktop so they have something added to limit your visibility using tags… i don’t know how they do it. Dexter Roona recently posted…Link My Photos – Cool Instagram Hack or is it more than that? The8App is very different, it has the sponsor deals you get on Instagram built in and open to all members that not just those with big following. And so far i don’t think i have lost a single follower. But we will see how it goes when it gets big but by then it won’t matter I will be over that invisible momentum line that i talk about. I’m definitely going to have to come back and read and re-read this. I’m still a novice on Instagram, but looking forward to maximizing its use! Thanks for sharing! Dexter Roona recently posted…How to grow your network successfully? In my opinion paid services are just a bad idea and it doesn’t stop them unfollowing you. The8App is a better option if you want to build a big following and get paid. Just looked at zen-promo and no not for me, I can see grammers getting into trouble as they get caught in automation nets. Plus im fighting for social media to pay members not for members to pay out. Dexter Roona recently posted…6 ways to get mentored by anyone that you would like as a mentor. I do not agree!!! People lose subscribers not because of such programs, but because the content is of poor quality, uninteresting … bad. Hashtags are poorly matched. and much more. There are many different bots for instagram, facebook and other social networks. We live in the 21st century, do not forget it. I use the bot instagram https://ingramer.com. This is a multifunctional application. I began to spend less time on the Internet. Messages, subscribers, unsubscribe, hashtags and more he does. I do not lose followers. The main thing is the correct settings and the quality of your account. The point being there is a culture on Instagram of members who just follow in the hope of being followed back and they then unfollow. It’s not about content or what your doing it is about them tricking you to follow them cause they followed you and then just unfollowing. If you don’t follow back they unfollow anyway. The plan is just to unfollow. Thank you for this article. It is a very useful article for me. I have gained so many new things that how we can increase the engagement of people on our Instagram by working on just simple steps. I will surely follow this steps on my page. As we all know social media is a very important platform on which we can do marketing as well as advertise of any type of product or services.